Verified integrity of ICD-10-AM/ACHI/ACS Tenth Edition Commonwealth material by the Independent Hospital Pricing Authority (IHPA). ICD-10-AM/ACHI/ACS Tenth Edition is now available for the platform of your choice - Windows desktop, iPhone, iPad or Android device. TurboCoder is the most cost effective and practical coding solution to meet the demands of efficient, accurate medical record coding. It will enable you to code medical records faster and more accurately than ever before. Download Brochure for more information Please email us for a quote. Please visit turbogrouper.com.au to find out our grouping solution. Program signed with Verisign code-signing certificate - Secured! Approved by the Health Information Management Association of Australia (HIMAA) and TAFE for students' use. 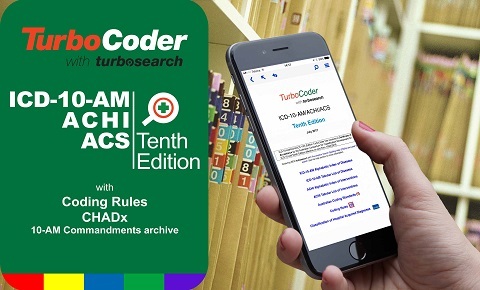 What is the ICD-10-AM/ACHI/ACS TurboCoder? ICD-10 is also published by EIS for the World Health Organiszation using eComPress®.